Captive nut angle fits over the standard perforated angle. One leg is used to fix it to the perforated angle, another leg with the captive nut can accept long 10-24 screw. 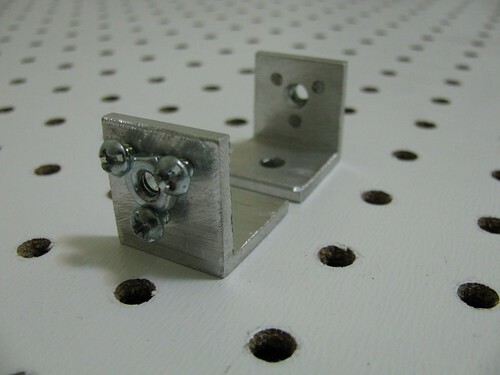 Several of these angles can be used to fix a tool such as drill or dremel to the frame. Install two 6-32 screws from outside. Place the nut under their heads and drive a 10-24 screw from the inside. Install third 6-32 screw and tighten all three, making sure that the 10-24 screw is not locked and can turn. If 6-32 screws stick out too much on the other side, use file to flatten them.